Let’s not talk about the fact I’m currently at the epicenter of the polar vortex, or the fact that it’s -30 degrees outside, or that there’s three feet of snow piled right outside my front door, or the that THERE IS NO END IN SIGHT. Blah. Instead, let’s talk about a simpler time of life. A time when there wasn’t even a thought of snow in my head, when the most fashionable thing I was wearing wasn’t a snowsuit, and when getting a peak at the sun wasn’t as rare as a Bigfoot sighting. 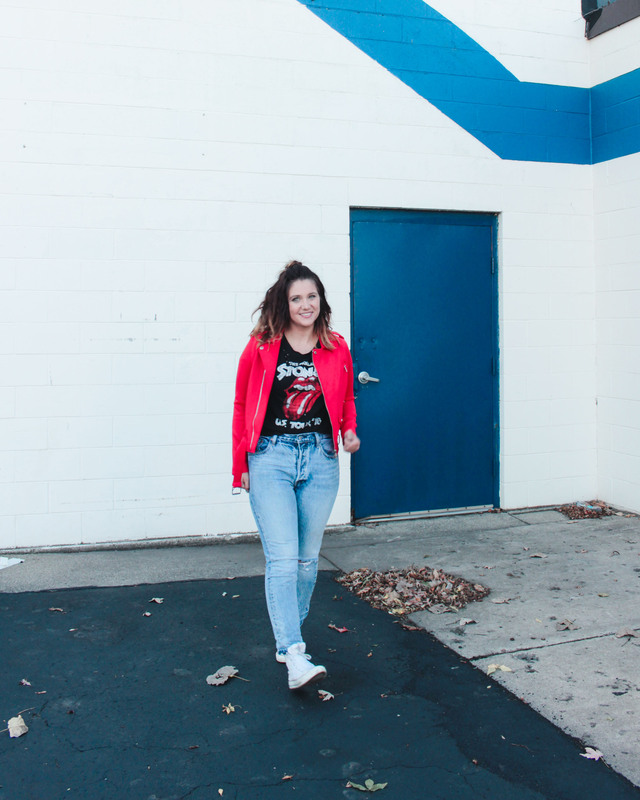 So let’s talk about fashion that makes me happy: colors, specifically my bright red moto jacket. 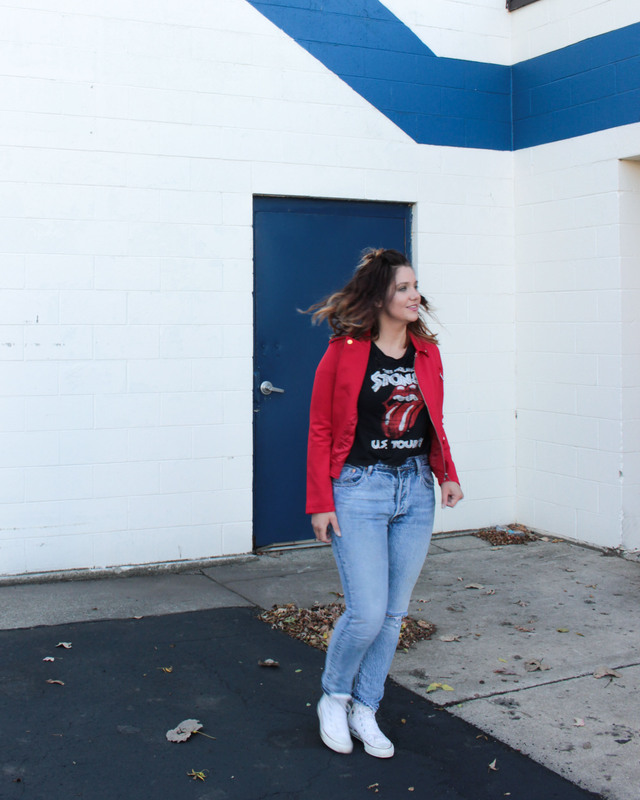 I’ve always loved wearing brightly colored pieces, but have struggled in the past with balancing color in an outfit. 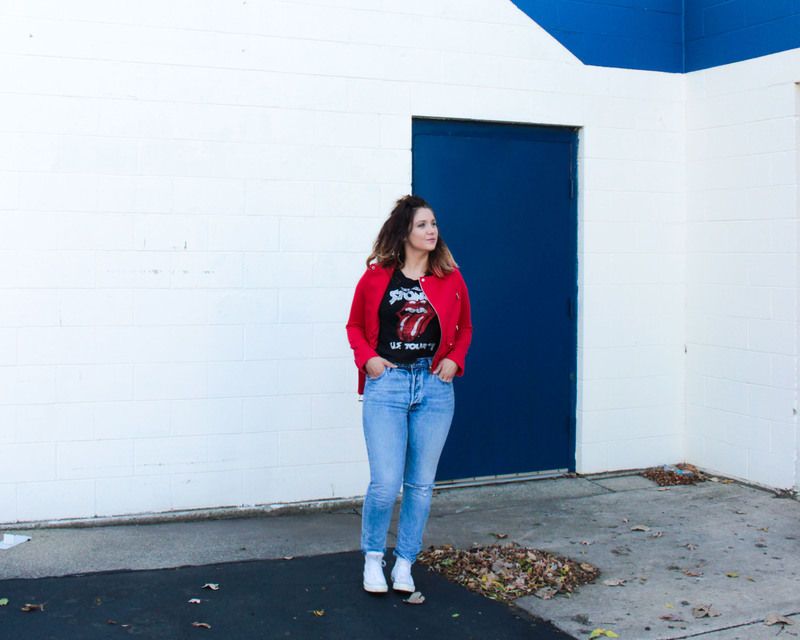 Lately I’ve been pairing my red moto jacket with a rock band graphic tee, vintage-style, high-waist Levi’s and Converse All Star High-Tops for a casual and fun look. Bright colors have always made me happy, and I hope they make you happy too. Moto Jacket – Banana Republic Vegan Suede Leather Moto Jacket, $179.00 at Banana Republic. (Size M, TTS). Another super-similar and more affordable option is Kut From the Kloth’s Haddie Jacket starting at $50.99 – $98.00 on Amazon. Tee – Pull&Bear Rolling Stones Tee, $27.00 at ASOS. (Size S, runs a little large). The most affordable and most similar option I could find. 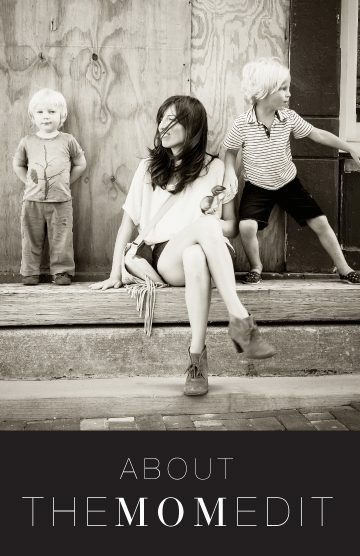 Free People has a grey Stones Tee by Daydreamers, who makes good quality tees, for $68.00. Jeans – Levi’s 501 Original Fit Selvedge Jeans, $128.00 at Levi’ (Size 28, runs large, order a size up) Selvedge jeans are ‘made from the natural edge of a roll of denim’ that makes it tightly bound, to prevent unraveling. 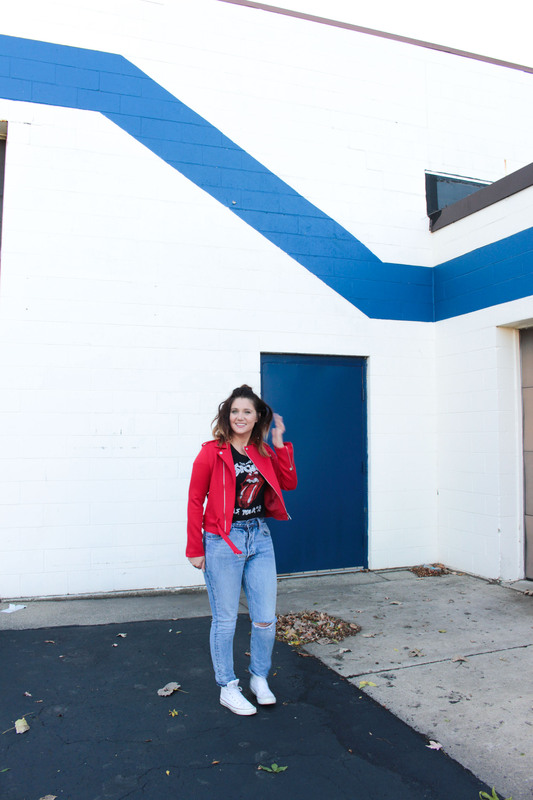 Basically, these jeans are made from high-quality, thick denim that can last you a lifetime if cared for properly, but they often need breaking in at the beginning. They are SO WORTH it though because they look and fit amazingly. Just ask Julieta 😉 The skinny leg version are on sale, but only available in select sizes. Sneakers – Converse All Star 70’s High Top Sneakers, $85.00 at Shopbop. (size 7.5, TTS). Just my all-time favorite white sneaks. I love this off-white “parchment” color that’s true to the original 70’s version. Hope everyone is staying warm out there! Follow me on IG: @jessbobess for more style inspo & shop my favorite IG looks here on the Liketoknow.it page. I love that TME is getting more inclusive by representing women of different sizes However, why aren’t the sizes worn for the clothing pictured of ALL contributors shared? It helps those with curves, like me, understand if brands are TTS. It seems your contributors on the small side always share their sizes. “I’m wearing an XXS! I’m wearing a size 24!” And those that are curvier – and quite frankly, likely represent most of your readership – don’t share their sizes. Why the disparity? Hey Courtney, thanks for the feedback! None of us intentionally hide our sizes from our readers. I know I’ve included my sizing info in previous posts & I’ll try to remember to do it more so in the future. Also, I’ve gone back and added sizing deets to this post. Have a great Superbowl Sunday! ADORE your hair. Super fresh and modern! Not adoring the jeans. Who has time for a ‘breaking in period’? 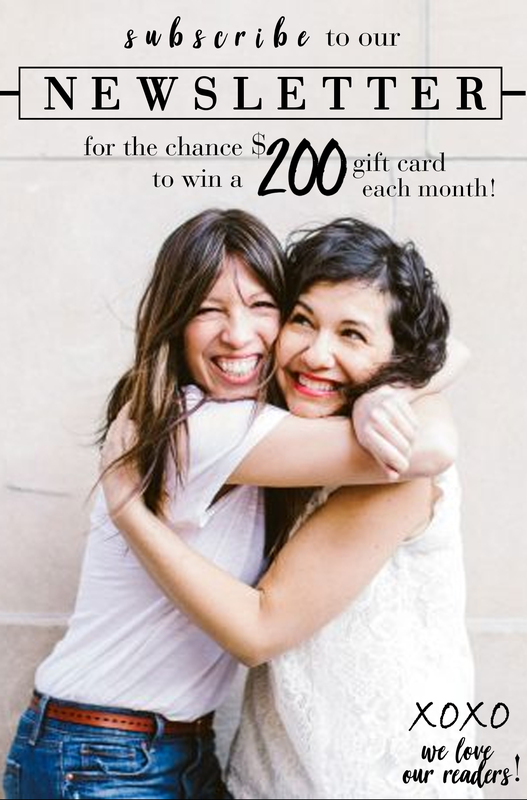 And for $100+ bucks, ladies – we better feel good from the get-go!